Mats Sundin announced his retirement after 18 NHL seasons today. Sundin was the first player selected in the 1989 NHL Entry Draft by the Quebec Nordiques, and played his first season on a line with Joe Sakic who also retired this off-season. Sundin retires the highest scoring Swedish player in League history, with 564 goals, 785 assists and 1,349 points during a career that was played exclusively in Canada, first with the Quebec Nordiques, then the Leafs and last season with the Vancouver Canucks. He was an eight-time NHL All-Star. Sundin is one of only five NHL players to have scored at least 500 goals and never played in a Stanley Cup Final. "No, not really," chuckled Sundin when asked if he had regrets over not winning a Stanley Cup. "I don't feel bad. On the other hand, I had so much fun playing in the NHL and I experienced so much, I feel I got what I wanted from that league." Swedish hockey fans will remember his exploits in International play winning World Championships in 1991, 1992 and 1998, and as captain of Sweden's gold medal winning Olympic team in 2006. 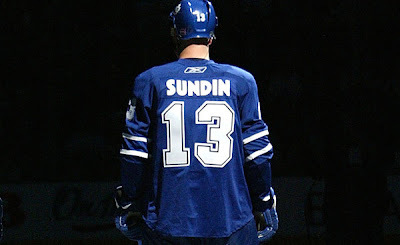 Sundin was a phenomenal all around player, as classy as he was clutch. He will be missed. Agreed, Sundin was both classy and clutch. 1. Do you think he deserves a spot in the Hall of Fame? 2. Do you think Toronto's lack of playoff success during his tenure was more indicative of him, or of the lack of talent he had to play with? 1. HOF? Definitely! Any 500 goal scorer should go. 2. Playoff failures belong to a team. Gretzky never won again after leaving Edmonton. The Caps didn't get knocked out last year because Ovechkin could not get it done.